Update: This resources is outdated and unmaintained : it probably won't work as designed with recent version of Krita. Check the 'extras' category to find the most recent brushes. "Un bon artisan prends soin de ses outils"
A french proverb roughly translated by "a good worker take care of his tools". This is still into this spirit I keep care of my brushkit ( and in extensio to the softwares I use ). All the thumbnails were totally redone to match a new standard document I worked on with Timothée Giet (aka Animtim) and Ramón Miranda. This document is on the development wiki of the Krita project: http://community.kde.org/Krita/Brushes_Preset_Preview. 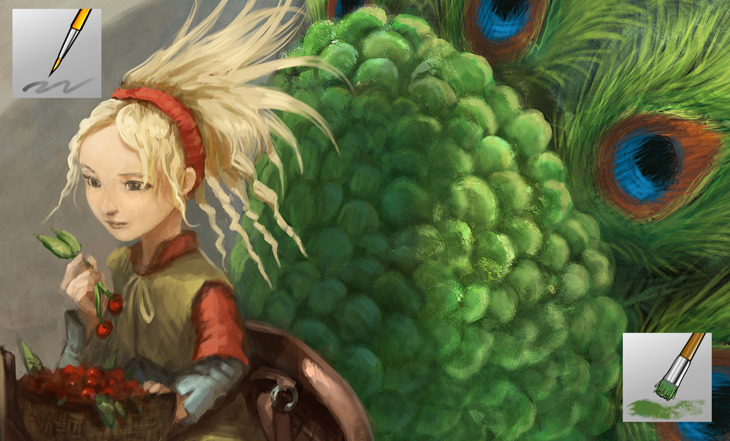 Now, there is standard backgrounds, composition and colors to make all the brushkit consistent. The goal: have appeal and consistency to merge external brushkit as mine into the main version. 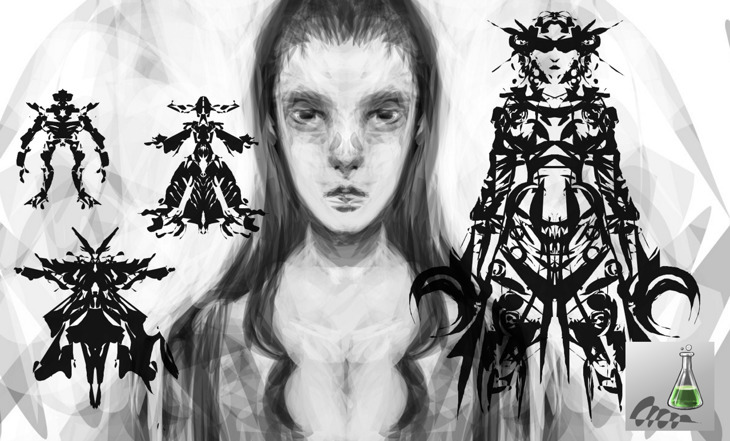 So, don't be surprise to see some of this brush -maybe not them all- being a part of the default Krita brushes. Compare to the V2, my airbrush with blending modes are back (you can find brush with an embedded blending mode with a little gear/sun symbol on the top-left of the icon.). A. A normal one, reworked to be fast with big size, and as smooth as I could for this speed. C. An overlay airbrush; this one can darken or lighten; depending if you select a color with a value over 50% or under 50% ; I use it to vivid a bit my colors, to darken some corners to get an easy vignette effect, or to do little halo of light here and there. 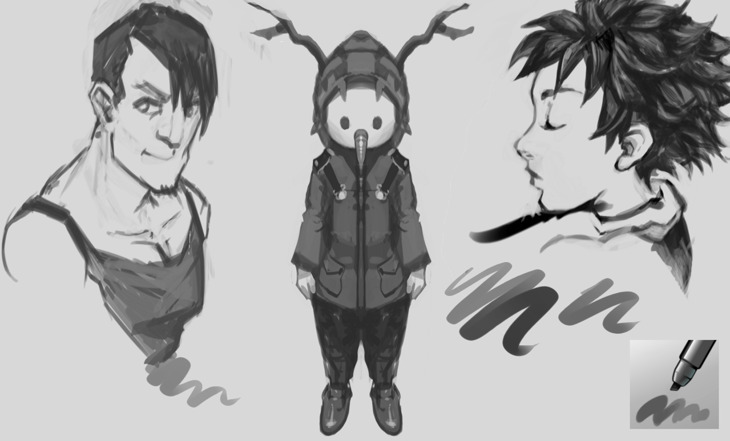 I also added a new brush I found convenient to doodle; it has a bit a flat plastic feeling, but works well at blocking value with pure area of grey. It has sensor on size and opacity, but capped with a minimum amount to not be too much expressive too. 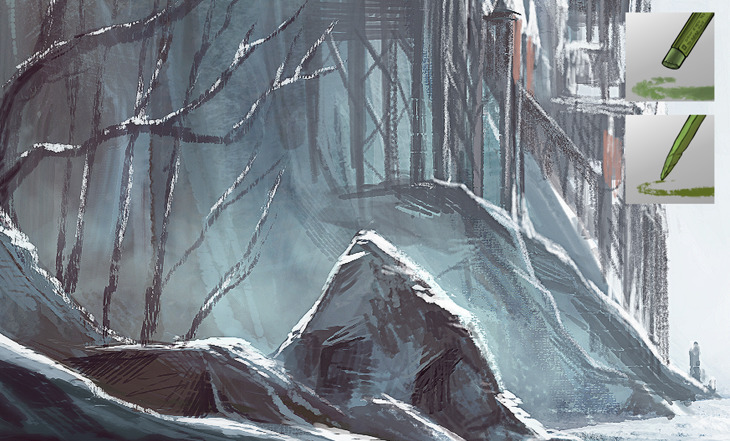 When I'm out the focus point of the artwork, I like to brush the details with a preset doing a sort of rake/bristle texture. One of the two, 'block' takes advantage of a new feature in 2.8dev ; 'fan corners' made by Dmitry Kazakov . I'm happy this time, because it's years I try to tweak the 'deform brush engine' to obtain a sort of Iwarp brush. Now I got one, and I can tweak proportion on my sketch without getting too much blur. Talking about preset looking like tool, I also added a 'clone tool' to the preset. 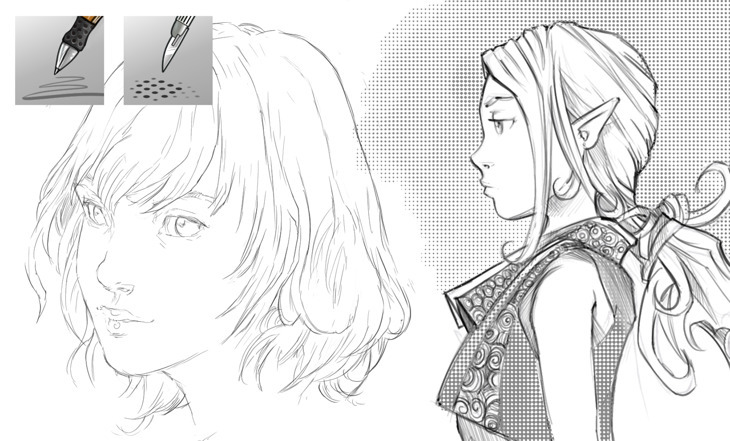 I don't use Screentones often, it's more like a 'proof-of-concept' brush preset, but I like to keep around. And about 'Drawing pen', I can't live without. Every sketch / drawing I do with Krita start for me with this little thin rounded brush with a high expression on the size and opacity. 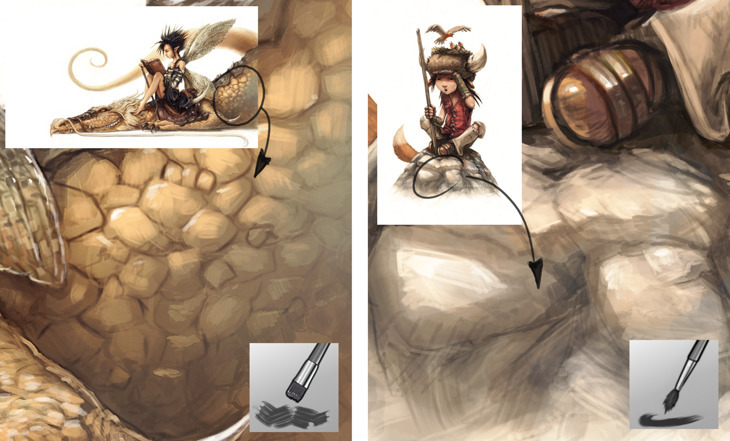 It allows me to draw various level of sketch details with the same brush. It's an adaptation of my old Mypaint brush kit. The experimental brush engine does the same effect as the famous Al.chemy software. I still use it or to doodle, or to speedpaint some hard surface object. All the fun start if you play with it and activate a symmetry mirror on the canvas. Frottis are thin transparent or semi-transparent glazes rubbed into the ground in the initial phases of an oil painting. From the French term "frotter", meaning "to rub". By the past when I was painting daily with traditional ( acrylic on canvas ), I was an adept of this technic. Using thin layer of pure painting not loaded on a dry brush and rubbing the surface to overlay thin layer of colors. In an attempt to find back this feeling , I made this presets; with a little of bristle and texture in it. I have a variation with blending mode to speed up my workflow; 'addition' to enlight, and 'multiply/product' to darken, glaze and shade. It also happen I sketch directly with 'Frottis' brush. 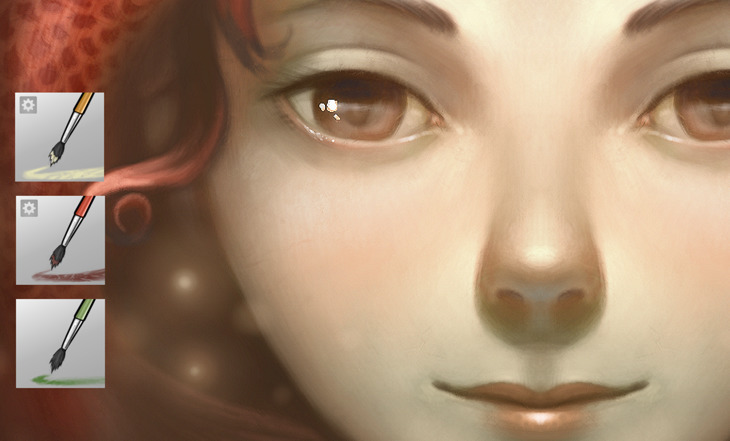 'Detailer soft' was recreated from my Mypaint brushkit. This is the brush helping me to paint thin details or subtle lines. It happen to me to keep this brush during hours when detailing an artwork. The bristles brushes, does various effects helping to get textured strokes, and more life and unpredictable rendering. License: the brushkit itself and thumbnails is released under the WTFPL 2.0 (compatible Public Domain and CC-0). Have a good painting time ! mentioned at the end of the article, 14 august 2013 . A great Brushset. I love the Movetool and the the textured bristles. From my own experiments i experienced how difficult it is to find good adjustments for these ones. The last two days i brooded over the brush preview problem... with no satisfying results at all. Okay now i will use the icons to match the standards. The placement is well balanced to put the maximum possible information in it, while keeping a clean visual result. Thanks a lot for all the good work! Hey, the girl responsible for the inking brushes that were posted at the KDE forums. These are looking good. Will definitely be trying them out and spreading the word on them. Out of curiosity, I noticed my own icons aren't too far from the standardisation you guys were thinking of, is this pure coincidence? Thanks a lot, you facilitate our work. merci et bravo pour ton travail, monsieur. T'as assuré encore une fois ;) .J'aime beaucoup les brosses "frottis"
Thx David for the nice brushes. Always use your brushes. @Kargall : Les brosses de type blur ne sont jamais inutiles. Pour ma part je suis donc preneur ! I love this brushkit, and also the cute icon design, especially the Experimental Brush, just like the one from al.chemy ! I can not stop making some doodles with it. "greedy artist on proprietary still protect their own" ? aren't you afraid someone get this brushkit, modify a little and sell them ? @Jose Navas (and to anyone else who is wounding if this works in windows as well)- yes u can. This is were I found my folder for Krita. Simply because you might have a different version, I use krita 2.7.8.10 64-bit. If you don't use RUN for whatever reason and you actually go into the files/folders manual then you need to make sure that hidden files are being shown to you. If not, you will get lost and never find it. Yes it is in a a hidden file for those who didn't know. Here is how you see hidden stuff in Windows 7, and maybe Vista as well - I never had Vista so idk if this is the same for Vista though :\ . Go to Start Orb> Type in "Folder" in the search bar> Click on "Folder options"> Go to "View" tab at the top> Look for "Hidden files and folders"> Make sure this is ticked "Show hidden files, folders, and drives" underneath "Hidden files and folders". And go find that file for krita! :P And to make hidden files hidden again, Use the way I stated above, if you closed out the window for the Folders options, but instead tick "Don't show hidden files, folders, and drives" not "Show hidden files, folders, and drives". I hope this makes sense, and is helpful to anyone who reads this. Thank you @KitKiit very useful! @João Apel Your welcome ^.^ I'm happy to help. Que du bonheur ! Merci David ! Thanks for the feedback everyone ! @KitKit & @Ren : thanks for the help about the Windows version install path. @Kargall :Merci ! en effet, je vais essayer de l'inclure dans une future 3.1 ; ( sans 'color rate' et avec un 'spacing' plus court de 0.3, et un nouveau thumbnail ) Merci ! @Therahedwig : Hey ! 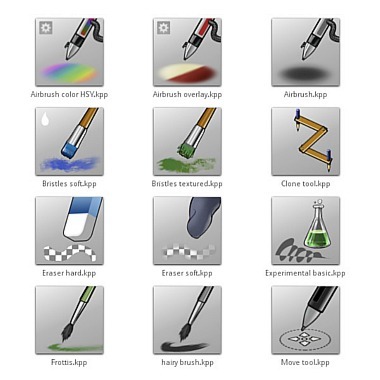 in fact the inspiration of angled brush came mainly from the early work of Tanda really sweet icons , on Mypaint back in 2009 , and also a mix of my V2 brushkit and set#2 of Mypaint, and way Ramon did and Animtim did. @susandevy : The WTFPL 2.0 license allows greedy people to make money on it :3 and I hope they will do a lot ! I'm already proud to feed for free few Asian who live with making illegal copies of my artworks on posters, cell phones, etc... Sometimes fans send me links from Ebay product ^ ^ even Sintel DVD ! So far the Basic Round Wet is the best brush ever! I love Sai due to the way the basic brush blends a bit and you can decide how much it's influenced (or influences) the colour already on the canvas, and I can say this one is even better! Krita is still fairly slow on my PC, but it could be because it's fairly old and needs a reformat - once I have the time and funds I'll get a better one anyway, but that's the only complaint I have for it (Windows version). Sorry, I was trying to download this, but it seems something is wrong with the link... :( The download goes too slow and then I get and error at the end. It isn't happening in other websites. Can you create a mirror, sir? Thanks. je viens de tester krita et vos brosses. venant de painter, je trouve krita très prometteur. Une petite limitation me peine : la possibilité de mixer la couleur du pinceau avec la couleur présente sur le dessin n'est pas généralisé à toutes les brushes (comme celles utilisant les patterns pour simuler la granularité d'un papier ou d'une toile). enfin une petite suggestion : utiliser un algorithme de bump mapping 3d pour simuler une épaisseur de peinture. @giffard philippe : Merci pour le retour et pour le test. Pour le mix avec la couleur du fond, plusieurs moteur de brosse peuvent être utilisé. Ma volonté n'était pas de faire un kit avec le 'color bleeding' ou 'color smudging' sur toutes les brosse. Ici , je préfère même les pinceaux qui ajoutent des couches de transparence ; plus dans l'esprit des encres / aqaurelles ; que celui de l'empatement. En tout cas, faire des brosses est facile, et je montrerai un tutorial dessus prochainement. Pour l'épaisseur de la peinture ; ce n'est pas encore dans la to-do list des developpeurs ; le logiciel subit d'importante modifications technique pour le moment, pour le rendre plus stable. Mais qui sait ; peut-être que plus de bénévoles codeurs viendront et implantront cette fonctionnalité. merci, un petit edit en forme de pénitence : je viens de tester la version 2.7, et certains moteurs qui le font effectivement. 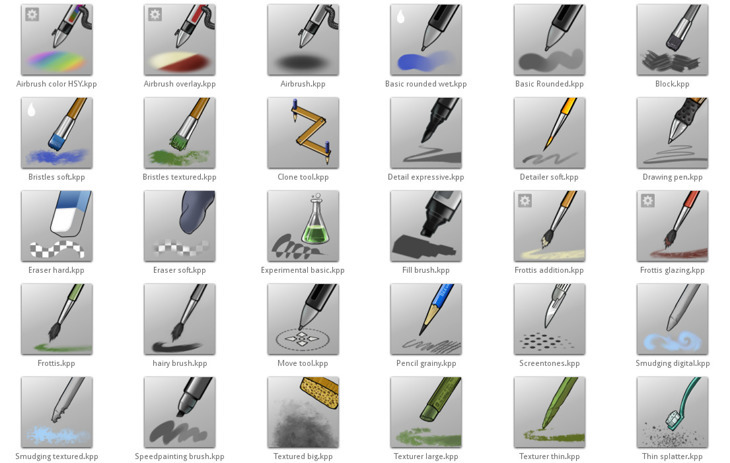 How do you remove the Krita default brush so that only these new V3 brushes will be in the list? May I ask if brushes on V2 and V3 are different? I mean if I install V3 would I still need to install v2 of your brush pack since it carries a different sets of brushes? Or would installing v3 carry all the brushes from v2 and then more? @Mark : V3 are an evolution of V2 ; also V3 correct some of dependencies bug with recent version of Krita. All Krita versions after 2.8 ( to be released soon ) have V3 by default among the default brush. @khary : Hi, on Ubuntu ; open the 'File' program , and in your /home/user/ ( default location on opening it ) press ' Ctrl + H ' on your keyboard to unhide hidden configuration files. Then you'll find the directory tree /home//.kde/share/apps/krita/ as in the instruction. Good luck ! Probably a daft question David, but am I ok to merge the folders with the existing folders within the Krita preferences directory under Linux? I'd rather not lose the default files, or at least the ones I've modified and I'm not totally confident with Linux yet. @Peter : Hi Peter ; I understand. 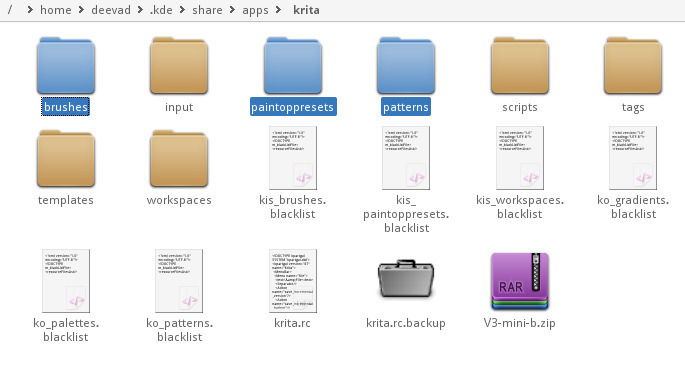 Before the merge, feel free to do a copy of the entire Krita pref folder aside. You'll be able to restore it if it makes mistake or overwrite your custom brushes. Normally there is really low chance ; but can happen in one rare case : if you have custom brush with the same name as mine. Good luck ! Thank you David - I love Krita, by the way: I've used Painter since the mid-90s but I find Krita's brush engine incredibly responsive under Linux. Just brilliant. @Peter : Oh nice ! merci monsieur. j'adore dessiner avec. ces brush sont très interessant et je pense avoir beaucoup progressé grace à eux. tout mes remerciement :) bonne continuation ! Merci pour ces brush, y a de quoi bien s'amuser avec ! Krita est vraiment un logiciel cool de dessin ! @Zed & @lili : Thanks ! @Ashwin Nandihalli : Hey, to edit the brush icon, you need to open your ressource folder ( in Menu > Edit > Ressources > Open ressources folder ) , then in your file manager open the paintoppreset folder, and inside, the preset files ( the *.kpp ) are editable with Krita. ( right click , open With > Krita ). For those wondering where the brushes and brush presets are located in Mac OSX, there is a folder in: users/USERNAME/library/preferences/kde/share/apps/krita where I suppose they could be installed. David eagerly await the new brushes for Krita 3.0 ....Please!!! Does anyone know how to download these brushes onto Ubuntu?